The Ornitho-Trainer enables you to practice recognizing bird species by sight or sound. Image mode and Sound mode. The image mode can be used without any modules installed or internet enabled. 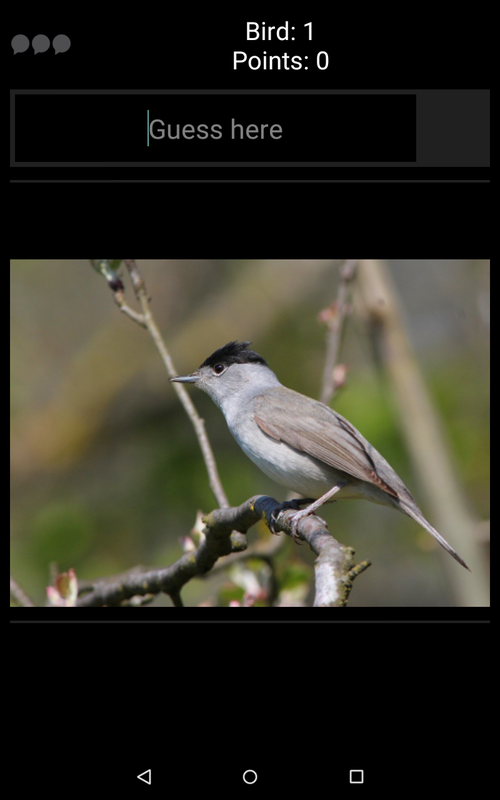 It will show a random image of a species and ask you to identify the name in the currently set default language. You can enable Latin names in the settings for both image and sound mode. With the image module installed you are able to add additional images to a species yourself. The Sound mode needs an active internet connection (the sounds will be streamed from the internet). Because of this you need to be patient, as some sounds might take longer to load (still usually just a couple of seconds) than others, depending on the the server capability and your connection. This mode plays 15 seconds of a random sound file (can be a song, warning call etc) of a species and asks you to identify it. You can listen to the initial sound again by clicking the gray button at the bottom left. If you need further hints you can enable up two two more sounds clips of that species by clicking the buttons beside that. Each further sound you enable reduces the possible amount of points you get for this guess (during Test mode). Test mode and Training mode. Correctly answered species during Test mode for Default lists award points, you can collect these points until you reach a certain amount of wrong answers (or quit the game by hitting the back button). The highest score you were able to get is shown in the Test list below. The Training mode can be done indefinitely and awards no points towards the high score, but every time you guess the name of a species an internal score (separate for Sound and Image) is assigned to that species. This score ranges from 0 (not well known) to 10 (well known). The score is used to increase the probability of lesser known species to appear during training. Each time you identify a species correctly the score of that species (again separate for images and sounds) will increase by 2 points, or, if you answered wrong, decrease by 4. In other words a species with a score of 8 will be less likely to occur in any Training list than a species with a score of 2. After you have guessed a species in Training mode this score along with the species' name is shown. You can also check the current scores of all the species you have learned by pressing the corresponding (Image or Sound) Button for 3 seconds. The Default lists offer a variety of common European species for you to train. You can check which species are in each list by selecting the corresponding filter in the Search by Name (e.g. the filter "EU Top 50" will show the 50 species used in the trainer with the corresponding list). The Custom lists allow you to make your own lists for any mode. Any list created with the Lists feature can be used, as long as it has at least two valid species (i.e. a species name that corresponds to the Ornithopedia species names) in it. If the same species appears multiple times in the lists the odds of it occurring increases proportionally.